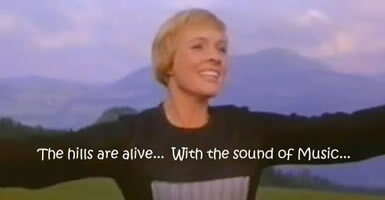 The Sound Of Music is the theme song from one of the greatest musicals of all time. The original Broadway production opened on Nov 16th, 1959 while the original London production opened on May 18th, 1961 at the Palace Theatre. In 1965 it was adapted as a musical film starring Julie Andrews and Christopher Plummer - winning 5 Academy Awards. The musical was written by Richard Rodgers (music) and Oscar Hammerstein II (lyrics). They were a very successful musical theatre writing team often referred to as Rodgers and Hammerstein - considered by many as the greatest partnership of the 20th century. Capo: Julie Andrews sings in the key of F# Major, so if you are playing with the video, you will need to place a capo on the 1st fret. The first verse is omitted in the video clip... starts at the first refrain. 1. My day in the hills has come to an end, I know. A star has come out to tell me it's time to go. But deep in the dark green shad-ows are voic-es that urge me to stay. For one more love-ly thing that the hills might say. Refrain: The hills are a-live with the sound of mu-sic. 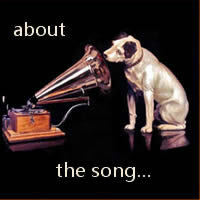 With songs they have sung for a thou-sand years. The hills fill my heart with the sound of mu-sic. My heart wants to sing ev-'ry song... it hears. That rise from the  lake  to   the trees. From a church    on   a   breeze. O-ver stones   on   its   way. Like a lark who is learn-ing to pray. My day in the hills has come to an end, I know. But deep in the dark green shadows are voices that urge me to stay. For one more lovely thing that the hills might say. From a church on a breeze. Over stones on its way. 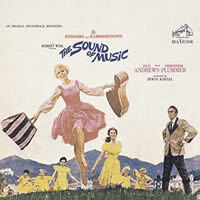 "The Sound Of Music" chords and lyrics are provided for educational purposes and personal use only.